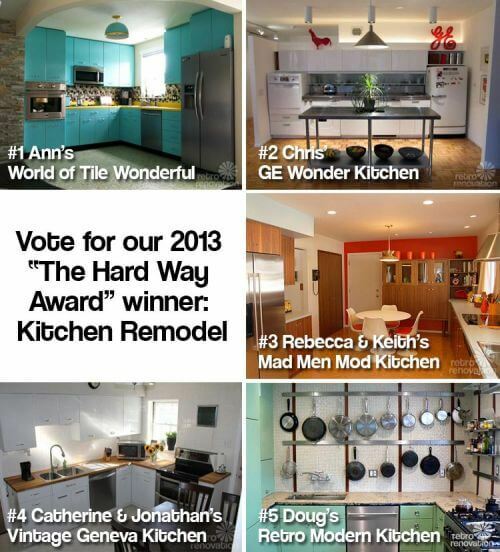 Every year we choose a winner of our annual “The Hard Way Award” — given to a reader(s) for their project remodel that often, went above and beyond in terms of overcoming obstacles and/or showing tenacity and inventiveness and/or Bang for the Buck. Sometimes the projects are spendy, sometimes, thrifty — everyone’s situation is unique, we like to showcase the diversity. 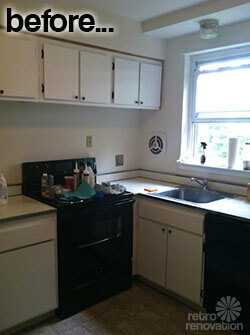 This year, I’m expanding the awards to encompass a “Bathroom” winner and a “Kitchen” winner. AND, we’re making it reader’s choice! Update: Voting now closed. I will announce the winners momentarily. . Above — #1, Ann’s World of Tile Wonderful — Click here to see the complete story about Ann’s kitchen remodel. 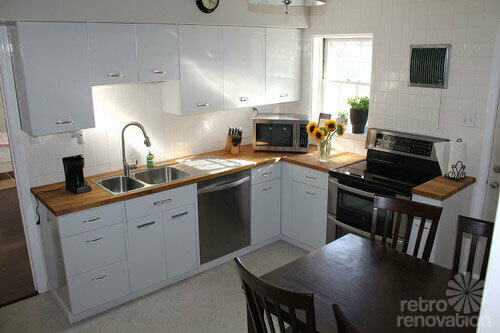 Inspired by vintage steel kitchen cabinets seen on the blog, Ann recreated the look — but using wood instead. 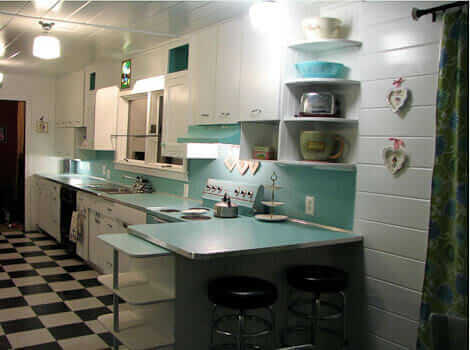 For her 1965 condo kitchen, she also purchased tile for the backsplash and floor from World of Tile, and did the installation herself. I love her daring use of color and pattern — and think this space came out fabulous! Above — #2, Chris’ GE Wonder Kitchen — Click here to see the complete story of Chris’ kitchen remodel. (No before photo available.) Chris lives in an apartment complex designed by the famous Mies van der Rohe, so he wanted to do something really special when he installed a “new” kitchen. 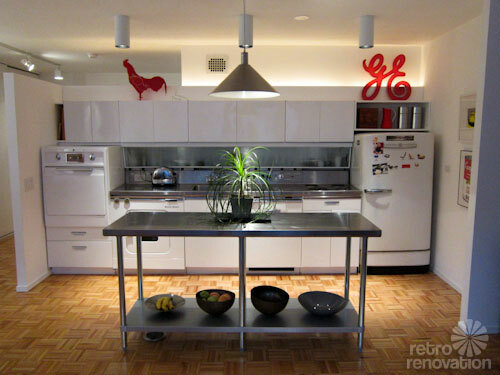 So, he found a vintage GE Wonder Kitchen, refurbished it, and installed it in his apartment. Fabulous! 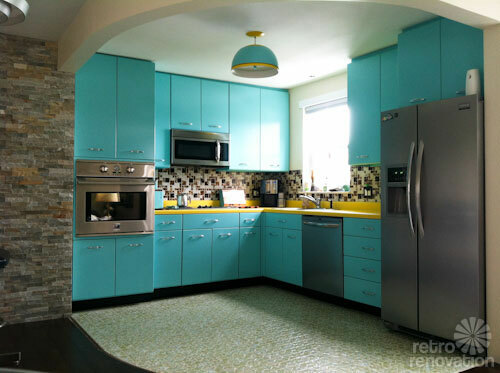 Above — #3, Rebecca and Keith’s Mad Men kitchen remodel — Click here to see all the details from this mid century mod kitchen remodel. 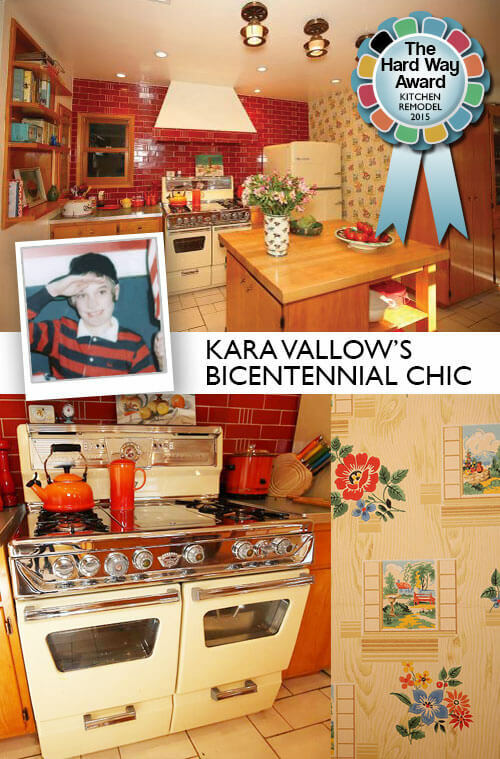 Rebecca and Keith had lived in their 1961 ranch house a few years before they decided to tackle renovating the kind of blah white kitchen. 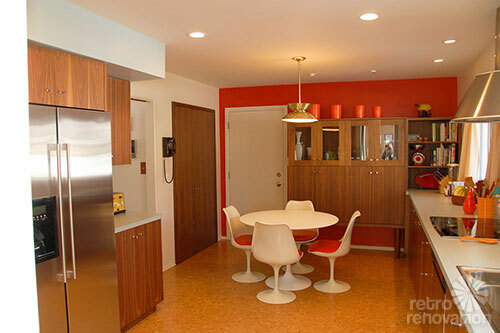 They carefully planned a lovely mid century modern style kitchen with custom cabinets, laminate counter tops, and pops of Rebecca’s favorite color, orange. Above — #4, Catherine and Jonathan’s Vintage Geneva Kitchen — See the complete story of Catherine and Jonathan’s kitchen remodel here. 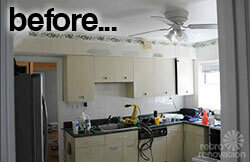 Catherine and Jonathan get major snaps for their DIY kitchen refresh in their 1950 Cape Cod. To help keep the kitchen going for another 60 years, they spray painted the existing vintage steel cabinets repainted, added a few carefully chosen new elements like Azrock flooring and butcher block counter tops. Above — #5, Doug’s retro modern kitchen — Click here to see the complete story about Doug’s retro modern kitchen remodel. And Doug is our last but not least finalist — he made my cut for sure because of his wonderful creativity in renovating his vintage concrete block Florida house. 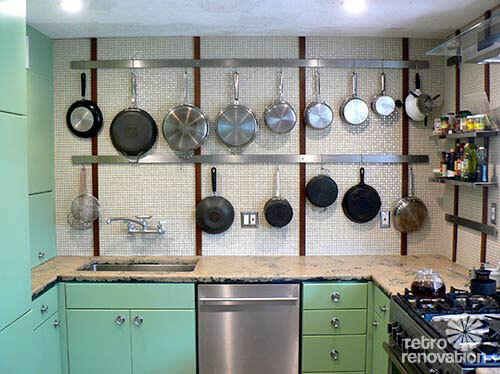 The kitchen is a retro-modern remodel that channels Julia Child’s pot rack — sans pegboard in favor of mosaic tiles… He, too, recreated the look of vintage steel cabinets — and has a paint recommendation… and more. 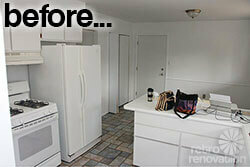 I love both of the kitchens with those incredible custom blue cabinets. I love that they both found a way to get the vintage steel cabinet look… but done with custom wood cabinets and gorgeous paints. So pretty! I’m so honored to be a finalist amongst this retrorad crowd!! 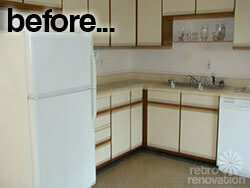 Thank you Pam and all you wonderful retro renovators, you!! This decision was so hard! Each kitchen is fabulous in its own way. I love how they are all on the small side. 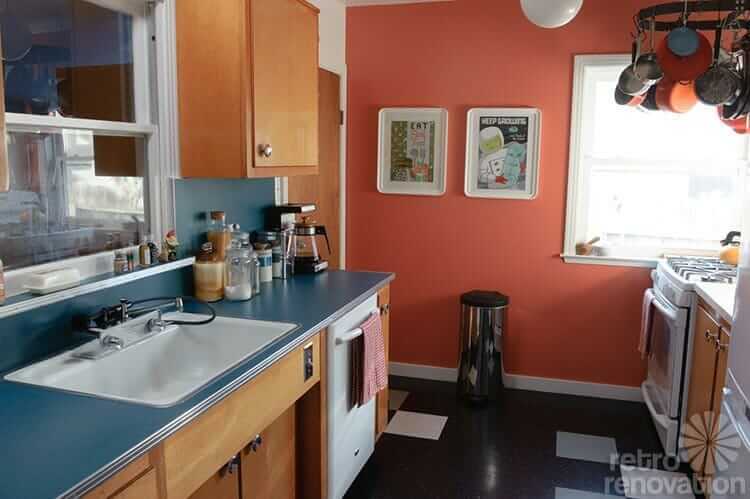 I have a tiny kitchen from 1937, myself. I’m taking mental notes for when I have the cash to upgrade. I voted for Ann’s because the turquoise and yellow combination make me happy.